If you are willing to break from the usual and do something interesting this valentine, here are 5 fun and innovative ideas. Ideal for couples seeking thrills and adventure for this Valentine’s Day. Read on for more details! This is the month of Cupid! February is here and it brings the coveted date of 14th February – Valentine’s Day. If you are the adventurous twosome that believes in celebrating this year’s Valentine sojourn a little differently, we are here to help you. Pack your bags, set out on a new adventure with us, just bring along your thirst for thrill and adventure and you will not be disappointed with the ideas we are about to give you! Strengthen your bond by supporting each other while climbing mountains – a task that can test the strengths and weaknesses within every relationship. It’s all about how you support your partner when they just want to give up! One such apex body controlling and managing Indian mountaineering expeditions in India is the Indian Mountaineering Foundation, which helps you plan and execute escapades to the Aravali Hills, Manali Valley, Kanheri Caves, Western Ghats and much more! You can also sign up for basic preparatory courses to help you learn minutes of rock climbing to get an idea first. This is a unique way to spend time together while dating; all it takes is a hint of madness and resilience to do something big in life… together as one! Want to serenade your lover high up in the skies? Soar far away from the world where only you both can see and feel each other’s smiles and pulses rising as you glide through draughty winds plummeting towards the ground… holding hands! Paragliding and Para-motoring services at Flyboy Aviation academy help you experience the thrills and chills of soaring rapidly through the blue skies. Take ‘selfies’ amongst the clouds! An option for a "flower shower" over your lover is also available. Try it! Make her feel special! The ultimate adventure sure to send chills down your spine and to take your breath away! Sign up for Rafting Tour itineraries when you plan a trip to Rishikesh. All packages are neatly designed keeping in both budget and thrill quotients of visitors. The tours are packaged in such a way that there is oodles of adventure and a great holiday experience to remember for a lifetime. A few packages, namely: Brahmpuri To Ramjhula, Shivpuri To Ram Jhula, Shivpuri To Ram Jhula, Byasi To Rishikesh can be considered. These packages also include body surfing and cliff jumping to accentuate the madness and thrill even more! For exclusivity you can also opt for a two-paddle kayak – only for the two of you. Explore your own city, but with a different twist - on a bicycle! Experience the rawness of Delhi with its unique mix of colours, invigorating sounds, scintillating smells, sumptuous tastes, unforgettable historic and scenic beauty as you paddle your way past busy Delhi streets. Many tour guides offer fascinating routes which cover the most interesting and intense historical areas of Old or New Delhi. All of the tours are interesting and unique in their own way, with different focus on many facets of the capital of India. Visit Rajasthan, but not just for historic sightseeing, but also to zip-line from the Neemrana fort into wilderness – a quick dash from historic allure to an aerial view of pristine natural beauty from a height! 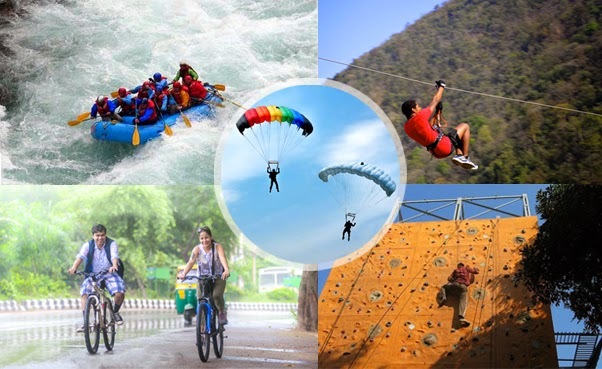 Flying Fox Neemrana offers a perfect escape from the bustling city for an adventurous day of fun and frolic. Their tour package consists 5 death-defying zip lines which are up to 400m long. Each of them helps you fly high over the Aravali Mountain range of Rajasthan with breathtaking views of the Neemrana Fort-Palace built in the 15th Century. Guaranteed to make you scream and shout with adrenaline pumped exhilaration, this trip can never have a dull moment! To top it off you see Mother Nature from a different angles as you swish past trees on a zip line that hurtles you forward with tremendous speed! These are some cool ideas that we felt every couple with love and adventure on their mind can surely enjoy. Visit these dream destinations in your own country within affordable budgets and bask in the glory of India’s adventure sports resurgence on the World map! Live free, holiday hard and love a little more!